We bought few Holiday crafts ribbon from the Dollar aisle of Target(One more interesting find). The ribbons are perfect for simple wrapping and weaving fun. I was inspired by the yarn bracelet ornaments on creative Jewish mom blog. CJ had lots of fun wrapping the ribbon around the bangles. Perfect activity to keep the little hands busy while boosting fine motor skills. 3. Keep wrapping until you reach the free end of ribbon. Tape the free end to the bangle. Add a ornament hanger and hang it on the tree! I felt the ribbon bangles looked cool as a ornament! But CJ wanted to play a game with it. She said "Mommy I made three of them, one for Daddy, one for you and one for me, so that we can play a game". The game was to place the ribbon bangles on ground, Stand on a start line, say ready set start and race to pick up the bangles. The person who picks up their bangle first is the winner. We played the game, it was fun too! Are you looking for some more fun activities to do with the holiday ribbons? Check out the series of preschool Ribbon activities on Teach preschool site! BTW, If you haven’t been over to Teachpreschool site hosted by Deborah, or her Facebook page, do stop by! Deborah has a fabulous website with lot of educational and fun hands-on Preschool activities and She is a great Inspiring person! Cute! Love the snowflake look. I love your blog! You have so many fantastic ideas! I was awardes the liebster award and so now I am passing the liebster award onto you!! Pretty! 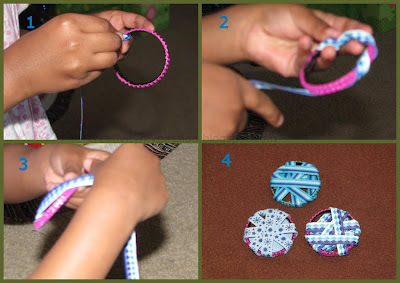 We have a lot of bangles that will soon be too small, and I love this idea for making them into a ribbon ornament. I could see this with canning jar lids too. Very clever. Canning jar lids is a wonderful idea @Dineen!